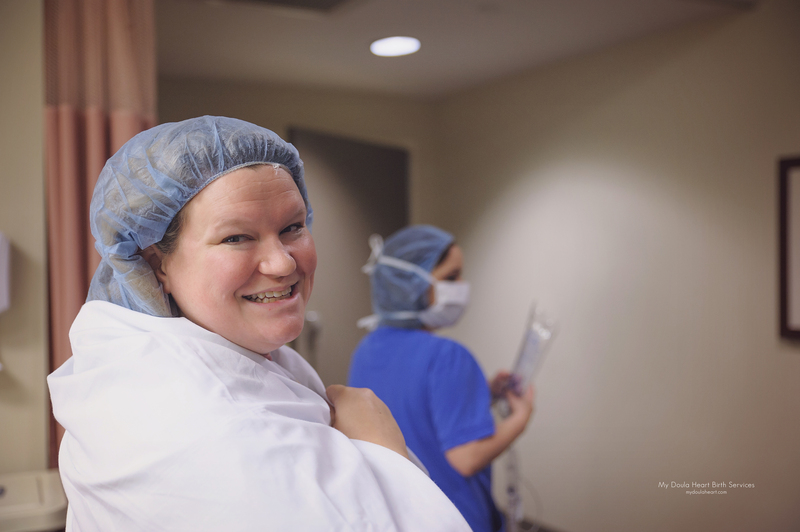 See, this was her 4th cesarean and even though her provider gave her the option of waiting until labor to see if she would have a VBA3C, or a repeat cesarean birth, Kate made the decision to have her baby via scheduled cesarean. KATE DID. I think that is one of the most important things to take away from this experience. The client made the choice to birth her baby her way with full informed consent. 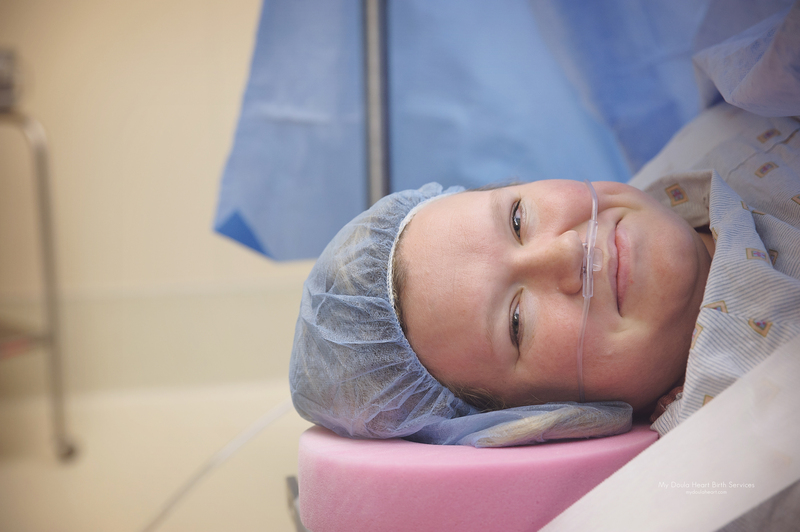 One thing Kate really wanted, was to have her husband present for her spinal and prep in the OR. 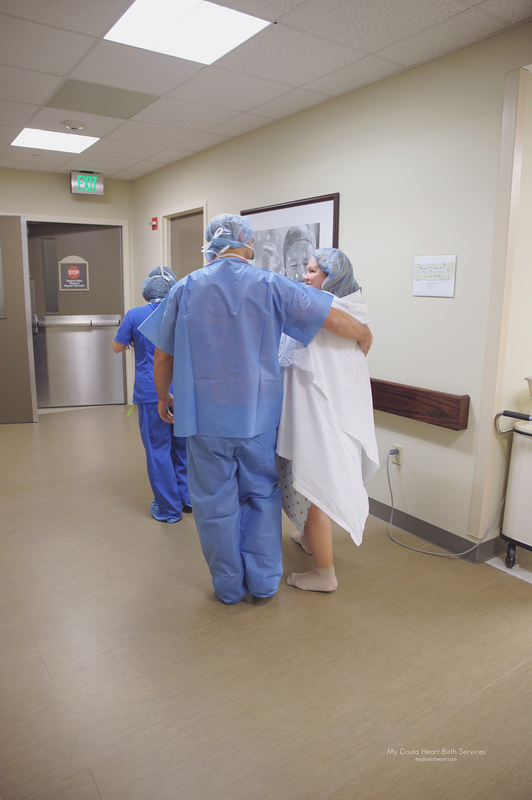 Typically, no one but the patient is allowed back into the OR before the procedure starts, but a wonderful anesthesiologist at Baton Rouge General had no problem letting her husband, Clint, back to help keep Kate calm. As soon as they were ready, Kate’s nurse came back to the room to grab me, and when I walked into the OR I was greeted with such an amazing staff. Usually, any guest is asked to remain seated near mom’s head, but today I was asked if I needed anything moved. I was free to roam the room. Kate was glowing and grinning ear-to-ear; she was radiant and she projected it at you whether you wanted it or not. Clint was observing the birth of his child. Then I hear “There is a lot of water!” *get ready Jennifer, it’s going to gush! * And that it did! I’ve never seen so much fluid! Sullivan Beau was born at 8:51a, covered in vernix, and weighing in at 11 pounds, 5 ounces. He was perfect and Kate was overcome with joy! After returning to her labor and delivery room, she kept exclaiming what a pleasant and healing experience this birth was for her. I was so happy to hear how wonderful her birth had been. For me there was such calmness, excitement, and peace at Kate’s birth! Just thinking about it, processing her images, and making her slideshow fills me with so much love and happiness. To think a mom had the birth of her choice with so many amazing providers to care for her and respect her. Every mom deserves the birth Kate had. Many congratulations to the Kennamer family!!! I am so humbled to have been welcomed into their special day to witness such an amazing experience. Please enjoy this slideshow of their birth experience and ask your providers about family centered cesarean births! The story of a child’s birth will always have a different version between mom, dad, and myself. Before any stories are shared from my perspective, as a client’s doula or photographer, the client and I have discussed their birth and it is posted when the client is ready for me to share. Clients always share their story first, either in text or conversation, before my experience. It is important to not alter a woman’s perspective of her birth. All clients see their blog post for approval prior to public posting.